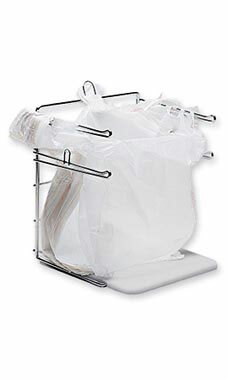 Keep your checkout area neat and improve productivity with this professional bagging stand. The bagging stand features a chrome finish with a thick plastic base for stability. The stand holds our popular 11 ½ x 6 x 21” t-shirt handle bags open for easy filling and can accommodate a large supply of bags. Our smaller 8 x 5 x 16” plastic t-shirt bags fit on hooks located on either side of the stand.